The devilfish's interesting features are his front fins, that look like fingers. He uses them to walk over the sand. 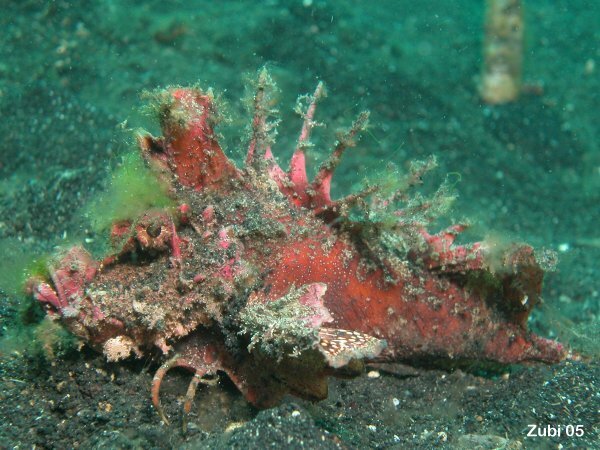 The tail is strongly curved to one side, like the stonefish. Der Teufelfisch besitzt eine Art "Finger", eigentlich Brustflossen, mit deren Hilfe er sogar herumläuft. Sein Schwanz ist wie beim Steinfisch stark gebogen. His spines are highly poisonous. Habitat: sand and rubble. 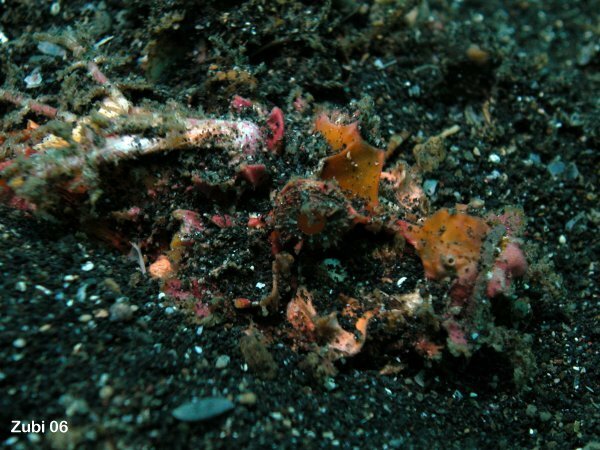 Devilfish are very difficult to see, most times they burry themselves in sand and only their spines are visible. In this case a identification as of I. didactylus or I. caledonicus or I. sinensis was not possible, since the main difference between these species is the color pattern of the inner pectoral fins. Die Rückenflossen des Teufelsfisches sind sehr giftig. Teufelfische sind sehr schwierig zu finden, da sich oft in Sand oder Geröll eingraben. If disturbed, he shows the orange insides of his pectoral fins as a defensive reaction. The different species of devilfishes (Inimicus didactylus, caledonicus, sinensis) are told apart from the color of their pectoral fins. 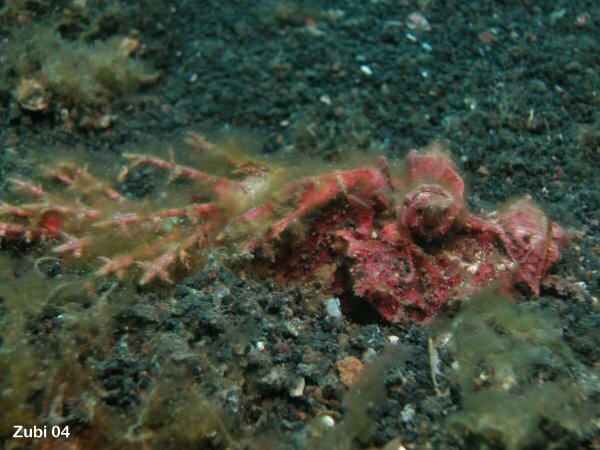 The devilfish on the photo above can easily identified as I. didactylus. Wenn man einen Teufelsfisch stört, so zeigt er seine farbigen Brustflossen als Warnung. 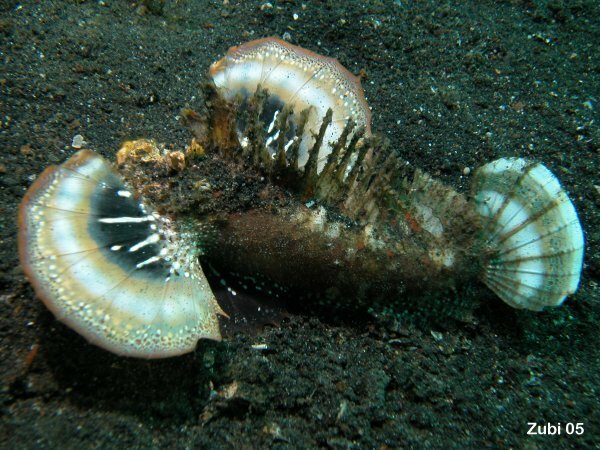 Von der Farbe dieser Brustflossen her kann man auch die verschiedenen Arten von Teufelfischen unterscheiden (Inimicus didactylus, caledonicus, sinensis). Die abgebildete Art ist eindeutig I. didactylus. As shown some devilfishes will also be coverred with algea. Oben sieht man einen Teufelsfisch, der zusätzlich von Algen überwachsen ist.